At our firm, you are more than just a number. New team members are folded into the CJ family the first day on the job. It’s your career, your life, and your choice. Cornwell Jackson provides a platform for you to grow your career from the ground up. At our firm, your experience will be hands-on, in-the-field, and side-by-side experienced team members. Start here, even before you graduate, and see how far you can grow. 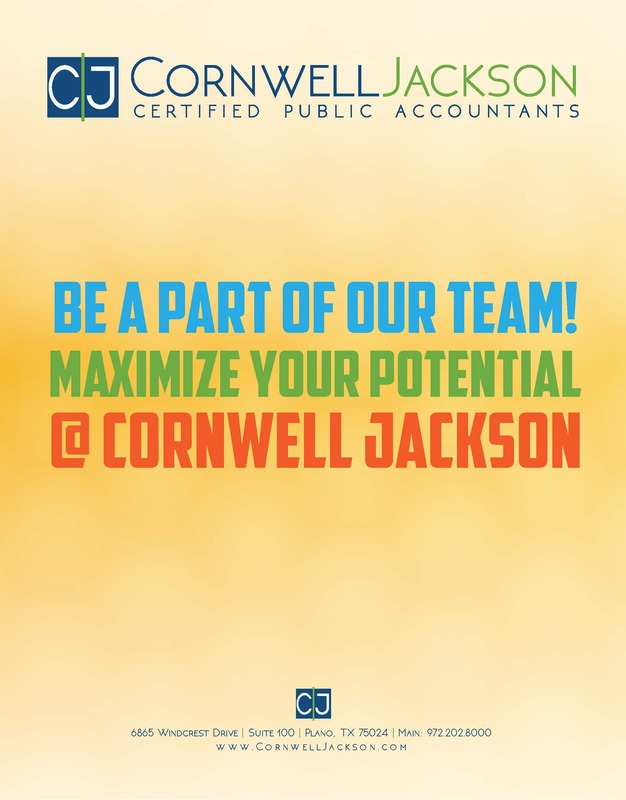 What makes a career at CJ in public accounting so great? Choosing where you will begin your career is a big decision. There are many things to consider when deciding on the firm you choose to work for, firm culture, mentorship programs, and camaraderie being at the top of the list. At Cornwell Jackson, we believe in the “farm system”, meaning that we cultivate our future leaders from within the ranks of our team. We truly believe that we are recruiting and training future business owners and partners for our firm. Additionally, since Cornwell Jackson is considered a large-local firm, our team travels around two weeks a year and works much less overtime than larger, national firms. This allows our team members to spend less time at work and more time with family and friends. The management team makes all firm decisions with the firm’s core values in mind. This ensures firm growth and team satisfaction long term. Check out our firm’s Core Values and Vision Statement here. Cornwell Jackson is looking for college students and graduates who want to be a part of our client centric team. In addition to the awesome benefits listed above, each CJ employee is given the opportunity to learn about tax compliance, auditing, mergers & acquisitions, tax planning, and business consulting services by working with management from beginning to end on a diverse collection of projects. As an intern, you will experience client engagements and special projects within our tax or audit team. Our clients are in a wide variety of industries – from metals and manufacturing to healthcare and auto dealerships. The experience gained during your internship at Cornwell Jackson will serve you well as you decide on the next step of your career. Choosing where to start your career is one of the most important decisions recent graduates make. At Cornwell Jackson, we invest in our team to grow their career at the rate best suited for the individual. Whether you decide on a career as a tax specialist or an auditor, we have programs built to help you propel your career towards success.